In apparel Manufacturing, “Production capacity” is one of the most important criteria used for vendor selection by the buyers. It is because; the production time of an order is directly proportional to the vendor’s production capacity. So it is very important that marketing and planning personnel should aware of the production capacity of their production units. The capacity of a factory is primarily expressed in terms of total machines factory have. Secondly, how much pieces the factory produces on daily for the specific products? In general, total numbers of machines in a factory mostly remains the same for a period. But factory may produce various types of the product during the season. According to the product (style) category, machine requirement may change and daily average production in each style may vary. So to be specific during booking orders, a planner should know exactly how much capacity he or she needed to procure the order in a given time period. A factory’s capacity is presented in total minutes or hours or in pieces (production per day). The method used to calculate capacity has been explained in the following. To calculate Daily production capacity (in pieces) one needs the following information. Make a list of the product category that you manufacture and get standard minutes (SAM) of all products you make from work-study engineers. If you don’t have product SAM then calculate the SAM. Suppose you are producing a shirt and its SAM is 25 minutes. This data is collected from the industrial engineer. Or calculate it with historical data. Suppose average line efficiency is 50%. Read the article - How to calculate efficiency of a production line or batch? Once you have above information use following formula to calculate production capacity. Production (capacity) planning is normally done based on sewing capacity. Having knowledge of the capacity in other processes (internal or external) is also very important. Otherwise, the planner may fail and will not be able to meet the dead line. Other departments such as cutting room capacity, Finishing room capacity, Washing Capacity and capacity of the value-added jobs. Over the time I have received questions on this article in the comment box. Which is currently not visible after upgrading the site. You can view old comments for this post here. I have added some selected questions in the post and answered those questions. Hope you will find the addition helpful. Q-1: Sewing line includes Sewing m/c as well as pressing m/c, do we need to take all the m/c or only sewing m/c for production capacity? kindly clarify. Answer: Good question. In the production capacity calculation formula, we are using product SAM to calculate the daily production capacity. Therefore, if you are adding finishing operation SAM, manual work (like marking, ironing) SAM, into the total garment SAM, those workstations will be part of the calculating factory capacity working hours. But as some of these workstations varied style to style, considering the sewing machines for calculating machine capacity in hours. Q-2: How do we estimate this 50% efficiency? And how does this influence the SAM? Answer: The line efficiency that we used here comes from the past data of the line performance. Line efficiency calculation method is shown in this post. SAM is the standard time of the style. Standard time will remain the same for a product. Garment SAM will not change whether the line work at 50% efficiency level or 80% efficiency. The production capacity of a line will change if line efficiency varies. In the above example, at 50% line efficiency, daily production target is 2400 pieces. If the line efficiency is 75%, daily production quantity will be 3600 pieces. How can I compute the production capacity? Thank you and more powers (hoping for reply). Find product wise average line efficiency. Out of the total machine hours, how many hours you will allocate for different items? Decide the number of hours you will allocate product wise. See the product wise production capacity Table- 2. I assumed production wise machine allocation, daily shift hours, and line efficiency as mentioned in the Table-2. Then follow the formula and find product wise production capacity. While calculating production capacity, always consider the learning curve. Q-4: It will not work if no. of products are very much. Say there are 100 type of products and all products manufactured in the same machine and takes different time there is no certainty of the requirement of the product then how someone can calculate installed capacity. Answer: It is normal that the product types that you make will change from time to time. SAM of the same product may also change. Production capacity in pieces (dozen) will change accordingly - if the product SAM and line efficiency changes. The number of machines can be fixed, and one machine can be used for making one product at a time. In such a scenario, don't fix/show the factory capacity in pieces. You can keep your machine capacity in hours per day, as it will remain the same. Calculate the production capacity for the current orders / current styles only or for the upcoming styles. Prepare a separate capacity report for each product type you are making with the time frame. For an example, suppose you have 100 sewing machines and currently you are making a t-shirt and shirts only. Out of those 100 sewing machines, 20 machines are allocated for making t-shirts (5 minutes SAM) and 80 machines are allocated for shirts (20 minutes SAM). T-shirt line work at 90% efficiency and shirt line work at 70% efficiency level. 1728 units of T-shirts and 1344 units of shirts production capacity per day. After a month suppose you got an order for making Polo shirt and a trouser style. So, in 20 machines allocate the Polo shirts and other 80 machines make the trousers. Calculate factory production capacity separately as above. You can increase /change the number of machines for the products as per requirement. If you get an order of multiple items at the same time, you calculate product wise capacity in pieces according to the machine you will be allocating for each style. See the below answer. Q-5: Will this calculation work out for other than garment industry I'm an industrial engineer wanted to know how I calculate about production for sheet metal or manufacturing industry please can you explain with the with respect to other machines like lathe, milling & drilling. If you can measure the machine wise available time (capacity) and if know the standard time required to make of item, use this formula and find out the production capacity of your lathe or milling and drilling machine. In the formula, line efficiency is taken into consideration, because - the standard given for the product is calculated at 100% working efficiency. But in practice, most cases workers take a higher time that the give SAM. If you calculate production capacity without considering the line efficiency, you will get a figure that can't be achieved. Q-6: How would it work for multiple items produced at a factory? This method will work for all factories even if they manufacture multiple items. You need to know the product SAM and product wise average line efficiency. You already have the capacity data in machine hours daily. (shown in the step#1). Out of those total machine hours, how many hours you will allocate for different items? Decide the number of hours you will allocate product wise. Then follow the formula and find product wise production capacity. While calculating production capacity, always consider the learning curve. Refer the Table-2. Q-7: In the formula Production capacity (in pieces) = (Capacity in hours*60/product SAM)* line efficiency. What is (60) in this formula. I cannot figure it out. Please help. Answer: In the formula, 60 is used to convert hours into minutes. Garment SAM is in minute, but we the calculated factory capacity is in hours (see step#1). Factory capacity is converted into minutes by multiplying by 60. Q: Great post! I have a question. 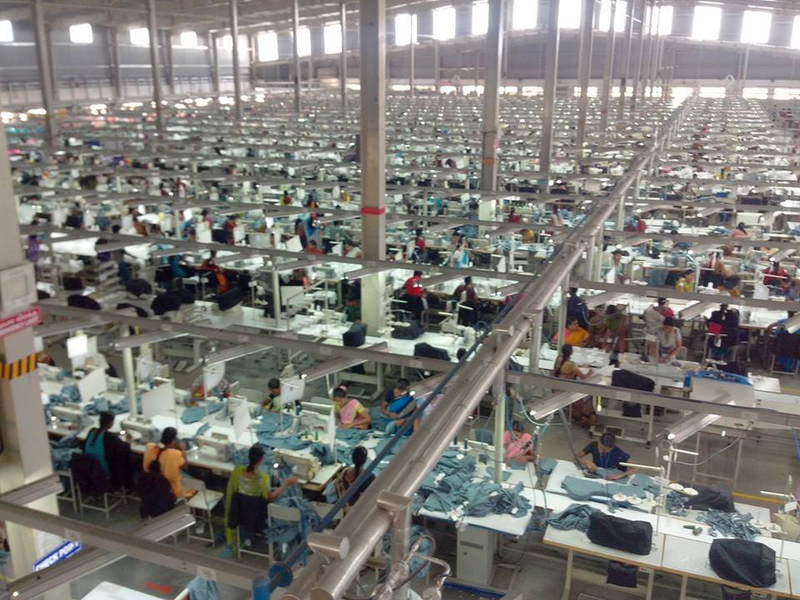 If our factory produces a number of mixed products (shirts and shoes, for instance), could the production capacity be calculated in terms of man-hours? Assuming I have standard times of all the production processes. Thanks in advance! Answer: Your question is already answered above. See my reply to JV Carpio. An example is shown in the Table-2. If you have any question, please feel free to ask me by posting your question in the comment box. Online Clothing Study: How to Calculate Production Capacity of a Factory? The basic production capacity calculation method for the manufacturing sector. Calculate production capacity of multiple items.